Yesterday was a really good food day in Manhattan: Late lunch for tacos at Tacombi Fonda Nolita; Late dinner at Marea. Solid Mexican street food to fancy, Michelin-star rated Italian seafood with a couple NY celebrity sightings thrown in like a bag of muffins. Bag of muffins? We’ll get to that. It was a milestone day for me, being my 40th official birthday on Planet Earth, so there was bound to be some good eats, a couple two-tree pops, and excellent company. The street-food kitsch is high, and the tacos are tasty. I spent $11 and had two meat-jammed tacos and an agua fresca. In LA, this would be an obscene price for tacos, but in Manhattan this is acceptable. In its defense, the quality of the ingredients is high here. If I want the real stuff and want to spend $5, I head to Sunset Park in Brooklyn, namely Tacos Matamores on 5th. If I want fish tacos or al pastor in Manhattan, I eat at Pinche Taqueria on Mott Street. 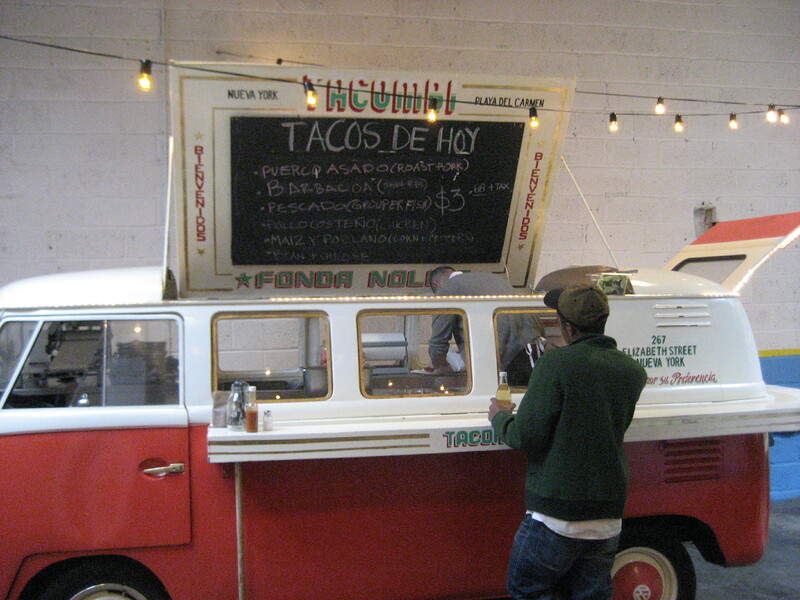 From what I’ve read, Tacombi’s chef Dario Wolos who hails from Monterey, Mexico opened a tasty taco stand in Mexico out of VW van and people loved them. Well, the version on Elizabeth Street in Nolita is still taco stand and VW van, but inside is what had to have been an old garage. It’s a large, spacious area–enough to fit a Volkswagon van and a bunch of tables and bar-height standing areas–and the vibe is bright, casual and friendly. You order at a counter on the number of tacos you want, choose from an assortment of agua frescas or Mexican sodas, then head over to the van where a taquerista (is that a word?) takes your tickets and you choose your tacos. I had the short rib (what they were calling ‘barbacoa’ which is traditionally goat, but not here) and the roast pork tacos which was essentially carnitas. There was grouper, chicken and a veggie one on the menu too, but I will have try those another time. The short rib taco was topped with chopped up nopales (cactus), cilantro, and hot sauce. I thought the pepper-looking topping was poblanos at first, but after asking I was told it was nopales (cactus), which were cooked slowly so they were mellowed, but still had a little crunch. They were a nice topping, but the star was the moist meat wrapped up in two tortillas. The roast pork was topped with pickled cabbage and were juicy in places, a little dry in others, but that is bound to happen when carnitas-style pork sits around. It was still quite tasty and I would eat there again without question. Tacos washed down with a sweet hibiscus-flower aqua fresca cut nicely through the wonderfully melty fat of the taco meat. There was no salsa bar or anything like that, but there was hot sauce on the table where you could see seeds in the glass, so be warned, that stuff is quite spicy if you’re adverse to heat. The people working amid the white-tiled walls, white-metal tables, skylight and indoor palm tree were very nice, in fact, one of the managers asked me if I enjoyed it and told me about the hours. Right now the hours are 8 am to midnight, but they are trying to expand until 2 am. I told him it would be an excellent place to be open late night in that neighborhood which they intend to capitalize on. The 8 am thing is because they are doing breakfast tacos, so given the quality of the food, that would be something to try. No cerveza to speak of yet, but that is coming as well as ceviches, cooking classes, backgammon tournaments and sporting events on the screen, according to NY Magazine. After lunch, grabbed a beer at my favorite casual German spot in that area, Loreley on Rivington Street. Awesome selection of German drafts, indoor and outdoor spots and tasty schnitzel sandwiches and fresh-made breitzels. You can get fancier food there too, but I’ve always stuck to the bar food and been quite pleased. Because of the time of year, they had four Oktoberfests on tap, so I tried the Erdinger version which was excellent. It was a wheat Oktoberfest, but not overly sweet and very balanced. Then it was off for some social time. Pre-dinner happy hour at WXOU Radio Bar in the West Village with friends is always a good time, especially when it’s not too crowded and you can score one of the big window bench areas facing Hudson. They have one of the best happy hours around that runs to 8 pm Monday to Friday, and is free of pretension. ‘XOU, as it’s kindly referred to, retains a 1940s/1950s look with the wood bar and mirror panels, wood benched seating areas and a fairly solid jukebox though it’s changed over the years. But there is no Red Bull or Cosmopolitan crap here. This is a beer and drinks bar. They have a decent beer selection that runs the gamut between Sly Fox, Guinness, a few Kelsos and a couple other rotating taps. Mixed drinks are served in what look like juice glasses, but for $4.50 for well during happy hour, who could possibly complain? Hendricks and tonic, please. Click here for a take on Marea and the Martha sighting. Yeah, that Martha. This entry was posted in Uncategorized and tagged Aron Sanchez, barbacoa, carnitas, Dario Wolos, Fonda Nolita, German bar in NYC, happy hour, Loreley NYC, Mexican street food, NYC tacos, Tacombi, tacos, WXOU Radio Bar. Bookmark the permalink. – The person who serves your tacos is called the taquero/a – one of Mexico’s most humble yet most honored lines of work. – Barbacoa refers to a style of cooking – depending on the region in Mexico you’re in you can find beef, goat, turkey, cazon ( shark ), chicken. Goat is common, but our home town of Monterrey is big on Barbacoa de Res ( beef ). – Carnitas has lost its way north of the border in marketing and such. Carnitas, from Michoacan ( where the tradition is the strongest based on our travels in a VW Combi ofcourse around Mexico ) is mainly different cuts of pork cooked in its own lard then broken down on the chopping block and mixed upon request. Tacombi’s current pork taco is really a variation of a style that Aaron picked upon while traveling accross the state of Veracruz. Thanks again for the kind comments and look forward to seeing you here again. Happy 40th Birthday! !